It was another weekend of fun and entertainment as the commercial city of Aba, Abia State, experienced the fun and frills of the world-class entertainment encapsulated in the on-going Glo Mega Music Tour, which stormed the city on Saturday night. The show, held at the Eldorado Event Centre on the ever-busy Aba-Owerri Road, and anchored by the duo of Uche Jombo and Juliet Ibrahim, will remain the topic of discussions for a long while to come among the residents who were given sublime entertainment by the galaxy of showbiz stars such as the Who I Go Ask exponent, Omawumi, the dancehall master, Runtown, the Igbo ethno-rapper, Phyno, the King of the Streets, Olamide, aka Badoo and the Nabania creator, Flavour. The entire Eldorado Event Centre could not contain the massive crowd which spilled over from the hall to the open space in the expansive premise. To enable the thousands of overflowing crowd to also enjoy the show, the event organisers, Globacom mounted a mega LED screen outside the hall. Runtown, rated as one of Nigeria’s current and hottest musicians, opened the floodgate of musical exposition with his mega dancehall hits. He gave the crowd a full dose of dancehall experience and Fijobowo style, crowning his performance with “Mad Over You”. The crowd went mad over him elatedly. He was immediately followed by Phyno who practically set the roof on emotional fire. The Fada Fada crooner, who started his meteoric music career from the commercial city, held the audience spellbound for over one hour with his delightful club ‘bangers’. While he was at the crescendo of his performance, incidentally singing Fada Fada, Olamide, who had been waiting in the wings came on board, did a collabo with Phyno before swinging fully into his range of Shakiti Bobo songs. Olamide, aka Badoo, once more showcased that he is a universally accepted super star as he wowed the ever-responsive crowd with a deluge of hit tracks. Shocked by the response of the audience to his lyrics, in spite of the fact that many of the wordings are from his Yoruba ethnic stock, Olamide, who was very sharp throughout his performance, went on all fours on the stage, thanking his fans in Aba before declaring: “Honestly, I feel like I am playing in Lagos and not Aba”. He was full of appreciation to the crowd for the love they showed him. The Kokoma thespian, Omawumi thereafter stepped on board to add the feminine and soothing touch to the night of fun. Dancing with springs in her gaits, Omawumi soaked the audience with the best of Bonsue percussions. The Nabania master, Flavour, wrapped up the evening of funtainment with his Oyolema inspirational chant, proving that he rules the stage as far as band performance is concerned. The highlight of Flavour’s performance at the show was his invitation of the Nollywood icon, Kanayo O Kanayo, on stage. The lead character in the hilarious drama series, Professor John Bull, sponsored by Globacom, joined Flavour to sing the theme song of the program. The make-shift collabo by the duo received a thunderous applause from the crowd. Another high point of the night of funtainment was the kinetic exhibition by the funniest clown in Nollywood, Victor Osuagwu, who climbed the stage and threw in some weird dancing steps to the admiration of the audience, with some attendees joining him on stage for a ‘contest’. 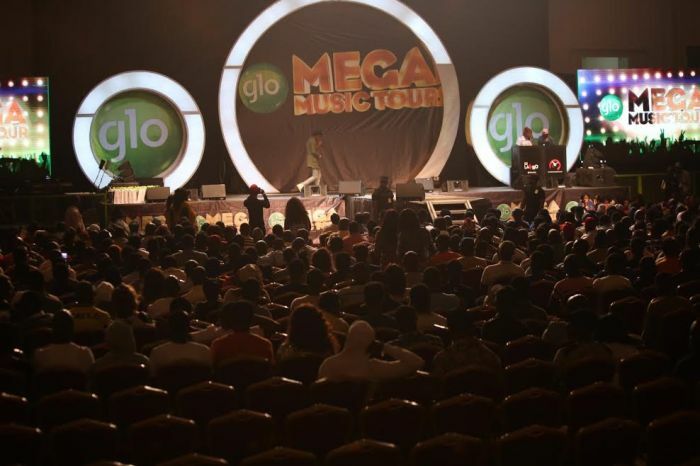 Welcoming the audience to the show, Globacom’s Zonal Business Coordinator, South-East, Mr. Lorenzo Gomez, said that “the Glo mega Music Nationwide Tour is specially designed to celebrate and reward Glo’s loyal subscribers. To appreciate local talents and gave them the platform to soar, Globacom lined up an array of local artistes to entertain the crowd. The company also showcased the winners of the #GlosingAba60secs online singing competition. The dancing competition staged at the event exclusively for attendees, was won by a teenager, Nancy Chizobam of Oxford International School, Aba.